The Deutsch Drahthaar (literally translated – German Wirehair) was originated in Germany around 100 years ago. The Germans wanted to create the ultimate versatile hunting dog that could do it all! 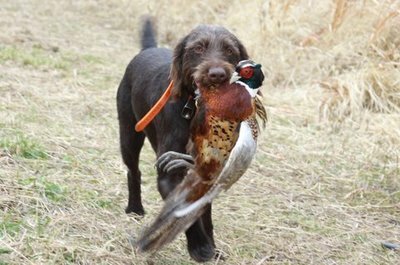 The Master Breeders chose the best versatile hunting dogs of the time and began to cross breed them to create what is now the most popular, and the most used hunting dog in Germany. The dogs used to create the Deutsch Drahthaar were the Sticklehaar Pointer, Poodle Pointer, Pointing Griffon and the Deutsch Kurzhaar. A versatile hunter needs a versatile gun dog. In the morning a DD will sit patiently in a duck blind and make 70 yard blind retrieves through frigid water. In the afternoon he will cast through the pheasant fields and grouse woods to find and point game. At the end of the day he will follow a blood trail to find game that would otherwise be lost. All of this is in a day’s work for these extremely intelligent and strong-willed animals. When you get home to unload your truck and clean your gear, your Drahthaar will be happily greeting your children and waiting to lay beside you on your favorite chair. And while you sleep, he will always have one eye open to ensure that you know if someone is approaching your property. 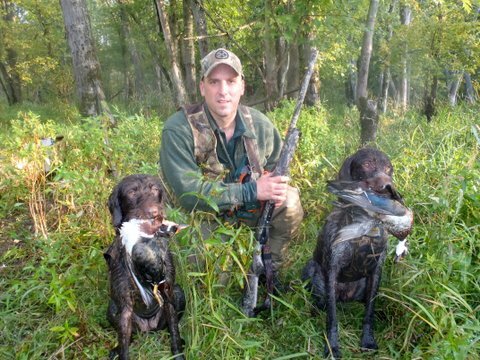 These dogs are the best family pets and hunting companions a person could ever hope for. The Deutsch Drahthaar was bred to love people and other dogs, yet the DD will never give up a fight with a crippled goose, a kicking pheasant, a wounded raccoon or a fleeing coyote. Deutsch Drahthaars are very willing to please and they are relatively easy to train, but require a great deal of attention, as well as vigourous exercises and mental challenges. The Verin Deutsch Drahthaar is not for everyone. They were bred to go into True Hunting Families. If you have never seen a “VGP” ( The VGP tests all versatile aspects that a true versatile gun dog should be able to accomplish) DD, it is hard to imagine the full potential of these dogs. 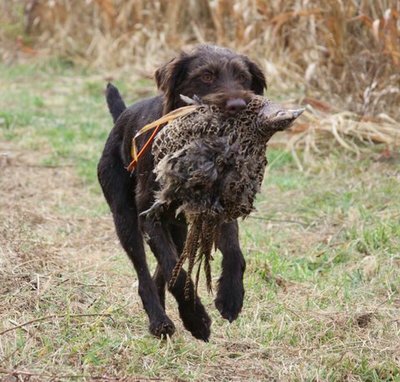 Only dedicated Hunters who are willing to dedicate time with their dog deserve to be honored with this Breed. Vom Grimm-Haus will never sell any dog nor pup to a non-hunting family. Besides being tremendous companions, DDs were bred for a reason: To find game and bring the gunner to a calm shot for a clean kill. Furthermore, and equally as important, DDs were bred to track and find precious game that would be lost without their keen senses. There is a quote: “The number one conservation tool on earth is a well-trained dog”. Thank you for your interest in my beloved breed and passion. The Deutsch Drahthaar were bred for a reason: To find game and bring the gunner to a calm shot for a clean kill, and more importantly, to find and retrieve game after the shot.